A Pilates Joe Springwall™ is a great way to fine tune your body. 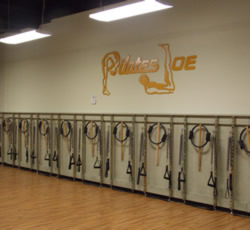 The resistance exercises on the wall are similar to those done on the Cadillac, Reformer, Tower and Mat. Taught by our Certified Instructors who customize each workout to fit your limitations and to give you a whole-body workout. Whether standing, sitting or laying down, exercises are done keeping proper form and alignment that is easy on your joints and can be used for working your legs, arms, whole-body or just stretching. After class, you'll feel stronger, more flexible and more aware of your muscles. You'll feel so good that you can't wait to come back for more. The resistance is what we need to develop our "core strength". You'll find yourself on our Springwall™ for more than half of our 55 minute classes to gain the resistance found in using the machine. The class will start with a basic mat workout using props such as weighted balls, weights, stability balls, bands, Magic Circle and foam rollers. The springs on the wall give you resistance (just like weights) to work out every muscle in your body while maintaining the proper Pilates position! We have expert instructors to guide and correct you every step of the way.